Bhubaneswar is the capital city of the state of Orissa, with a population of almost 2 million. As a city grows both in economic and area terms, transportation becomes a major challenge, and Bhubaneswar is no exception. Traditional modes of traveling like walking and cycling over the years have got less priority over motorized modes in a rapidly growing economy, which have had its pitfalls like congestion, pollution, accidents etc., which make daily commute or walk a highly stressful and risky one. Therefore there is a strong need now to make the city pedestrian friendly by providing them safe walkways and exclusive cycle lanes. To measure and benchmark the various conditions of walking, both tangible and psychological, a walkability index consisting of nine parameters viz. walking path conflict, availability of walking paths, availability of crossings, grade crossing safety, motorists behavior, amenities, disability infrastructure, obstructions and security from crime, were arrived at, slightly modifying the Global Walkability Index. 299 pedestrians were interviewed over 24 km at various land use types such as residential, commercial, educational and public transport terminals to analyze travel behaviour, preferences, areas for improvement etc. 1. Bhubaneswar scored an average of 50 out of 100 among the various land use types with public transport terminals scoring the least with 32 and residetial areas with 62, scoring the highest. While commercial and educational areas scored around 53. The approach to transport terminals like bus stops, railway stations by foot is very difficult, due to lack of safe, level and clear footpaths with cross- ings. 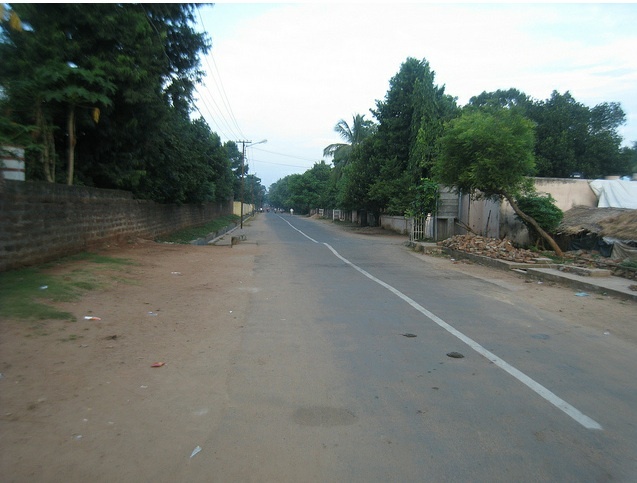 It is commendable that residential areas have good walking space. 2. Among the nine parameters used to gauge walkability, infrastructure for people with special needs scored the lowest with 25 and security from crime scored highest at 55. Facilities were poor not only for the differently abled but also for all pedestrians. Amenities like benches, public toilets, trees along walkways that encourage people to walk- were low, and in some areas discontinuous footpaths was a big letdown. The way a road poor condition keeps motorists away, similar is the case for pedestrians. 58% wanted them no more than an average distance of 100m. People did want to walk more than 100m to cross the road safely and wanted vehicles on the road to move slowly to enable easy crossing. This can be achieved by better designs and enforcement through signs, traffic calming measures like speed breakers etc. It is a myth that crossings at regular intervals reduce vehicle speeds. Through regulated crossings, vehicle speeds can be improved since drivers will be alert in knowing where pedestrians will cross, improving safety at the same time. 4. 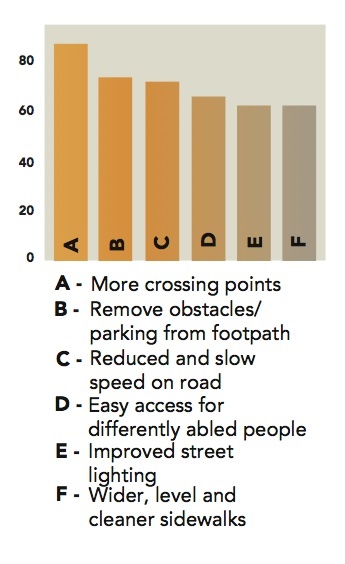 While only 21% felt that pedestrian facilities were good to best, the remaining 79% felt that it was worst to ok. Since a large percentage of pedestrians had a bad opinion about the infrastructure accessible to them, it can definitely be inferred that they would like to see better facilities, which not necessarily be capital intensive. Provision of safe, at grade crossing facilities for pedestrians scored highest on the pedestrians’ wish list with 81% wanting it. At grade crossings were preferred more than skywalks or subways, since it is easier for the elderly, children and differently abled friendly and highly economical. An effective parking policy should be in place, since 70% felt that obstructions, including vehicles should be cleared from footpaths. 60% of respondents felt that better street lighting should be provided along with wider, level and clean footpaths. Infrastructure for differently abled people also requires attention since 62% of people felt concerned that there was very limited mobility for differently abled people, thereby not providing equal opportunities to them. 51% of pedestrians wanted to shift to 2 wheelers and cars if no improvement was carried out to the pedestrian facilities. This is a trend prevalent in many Indian cities, which have embarked upon pro-motorized policies, ignoring the large walking share of pedestrians. Such a situation will only make the cities more congested while simple mode of walking becomes more and more difficult. The other dangerous trend in reducing pedestrians and public transport users is the exposure to air pollution. 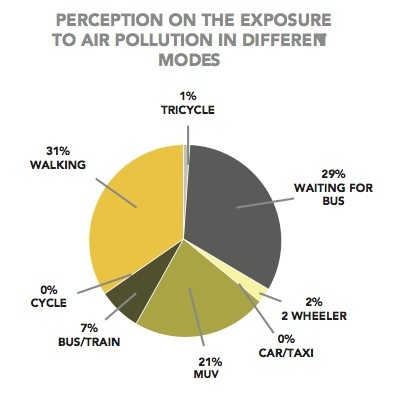 31% of respondents felt that they are most exposed to air pollution while walking and 27% when they are waiting for the bus. This is an ironical situation since walking and public transport has very low to no emission, but people using them are still exposed to the hazards of air pollution. Such a situation will further increase the divide between the have and the have not’s. Download Improving Walkability in Indian Cities here.